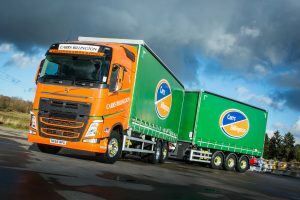 Agricultural and rural supplies specialist, Carrs Billington has put a new Volvo FH drawbar into service. Supplied by Volvo Truck and Bus Centre North & Scotland, the 44-tonne FH13.500 6×2 rigid combination will be based at the company’s Milnathort Country Store and supply depots in Perth and Kinross. Featuring a fixed lifting tag axle on its 5,600mm wheelbase chassis, the truck has the D13K engine rated at 500hp. Behind is a 12-speed I-Shift automated gearbox, driving a Volvo RSS1356 single reduction axle with a ratio of 2.79:1. Volvo’s Drive Plus and Living Single Bed packages are included in the Globetrotter Cab’s specification alongside a high-power audio system. The front steel, rear air-suspended rigid will spend around 99% of its operating time, as a 44-tonne drawbar combination. Finished in Carr Billington’s eye-catching orange and green livery, with contrasting logos, all-round Alcoa Dura-Bright alloy wheels finish off this new drawbar combination perfectly. “Priden Engineering made the curtainside bodywork and Lawrence David supplied our drawbar trailer. The entire vehicle has a payload capacity of 27 tonnes and we’ll use it for collection of bulk supplies and distribution of customer orders. Our vehicle utilisation percentages are always very high, the new Volvo FH13.500 will rarely be empty,” driver Keny Hanley confirms. A long-standing Volvo customer, Carrs Billington has operated its Milnathort since 2000. Keny Hanley has 33 years HGV driving experience under his belt and his latest Volvo FH is already drawing positive comments.